In the latest issue of the Quarterly Review of Biology (Vol 86 Number 4, December 2011), in a paper titled “Multiple Sclerosis is Not a Disease of the Immune System,” Dr Angelique Corthals argues that multiple sclerosis (MS) isn’t a disease of the immune system: it is caused by faulty lipid metabolism. The very basic précis of the paper: looking at MS as a metabolic disorder helps to explains many puzzling aspects of the disease. MS cases are on the rise as a direct consequence of a high-sugar, high-animal-fat diet. MS is similar in many ways to atherosclerosis. This is not an incremental improvement of what’s known about MS, it’s a paradigm shift. Eventually it will change the way MS is understood, researched, and treated. Full disclosure: Angelique is a good friend of mine. I’ve seen every draft of this paper. It is not original research. It’s an overview of what is known to be known. It takes what has been researched, reviewed and replicated and reassembles it into something new: a jigsaw puzzle in which, for the first time, all the pieces fit. There are no pieces left out, none hammered in with brute force. It’s elegant, clean, and makes complete and utter sense. The medical profession has believed for a long time that MS is a disease in which the body’s own immune defenses attack nerve tissue in the central nervous system. [For an overview of changing medical wisdom, see The Incredible Journey, courtesy Rocky Mountain MS Center.] The disease’s main characteristic is inflammation, then scarring, of tissue called myelin which insulates the brain and spinal cord. Over time this scarring can lead to profound neuron damage. Researchers have thought that the fault lies with a runaway immune system, but no one’s been been able to explain what triggers the onset of the disease. They’ve linked genes, diet, pathogens, and vitamin D deficiency to MS, but evidence for these risk factors is oddly inconsistent and often contradictory. This frustrates researchers in their search for effective treatment. In other words, this new understanding of MS will finally make it possible to find effective treatment, including preventative treatment. It also sheds light on the vitamin D link. Vitamin D helps to lower LDL cholesterol, so it makes sense that vitamin D deficiency increases the likelihood of the disease—especially in the context of a high-fat/high-carbohydrates diet. The lipid hypothesis also explains the inconsistent evidence for MS triggers. 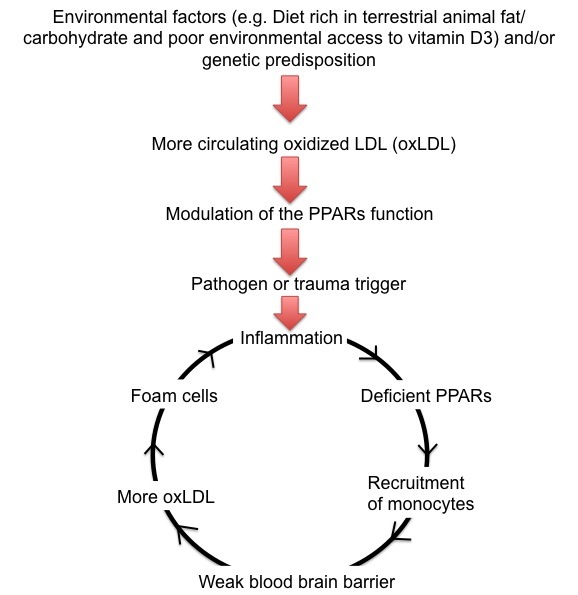 In many cases, Corthals says, having just one of the risk factors for reduced PPAR function isn’t enough to trigger a collapse of lipid metabolism. But more than one risk factor could cause problems. For example, a genetically weakened PPAR system on its own might not cause disease, but combining that with a poor diet can. Under these conditions, the body is “primed” for the onset of the disease, which is then triggered either by a pathogen (it can be any) or trauma, or even stress. Finally, the lipid hypothesis also explains why MS is more prevalent in women. And that, dear reader, is the magic word: cure. For the first time, ever, I think there might one day be one. Even better, we might be able to prevent MS. If you have questions—and I’m sure many of you do—please drop a comment here. Angelique has promised to answer as many as she can. I will, too. But please note: neither of us will give specific medical direction or advice. For one thing, I’m seriously not qualified. For another, there is no substitute for talking in person to your healthcare professional. I’m happy to share my opinion—I’m opinionated; it’s my blog—but do not construe this as medical advice. Angelique will discuss her understanding of MS in general, particularly as it relates to this new paradigm. But she will not tell you what you should do. There will be no exceptions. ETA: Comments are now closed. But comments are still open on my most recent post on the topic. Nigel: Thanks for reposting the link. The paper is on its way. Has anyone considered if the processes detailed in this review paper may also be applicable in other situations such as Type 1 diabetes and Alzheimer's? Ted: yes, very much so. I do believe a lot of autoimmune disease may follow a similar pattern (because they share similar symptoms/processes). However, I only concentrated my research on MS, so it would be too early for me to equate Type 1 diabetes and Alzheimer's to MS in the framework I am currently proposing without further research. (But I have a hunch that it will be done soon!). Also, there are many teams currently working on the roles of PPARs in diabetes and Alzheimers, and they are very much going in the direction of lipid metabolism as well. I would like a copy of the paper too, please. Anon, I need your email address. Just saw this on FB may be of interest! Nicola–I truly hope you contact the researchers at the ISNVD with your hypothesis-www.isnvd.org Nigel (above) links a paper I posted yesterday from the 1990s on the Facebook page I admin, CCSVI in Multiple Sclerosis. There has been over a century of research into the connection of MS to bloodflow…from Rindfleisch, Fog, Putnam, Swank, James. Dr. Zamboni found intraluminal truncular venous malformations, which change hemodynamics–just as they do in Budd-Chiari disease. NO and endothelial dysfunction could create restenosis, but so could a return of an intraluminal flap or inability to repair a malformed valve. If you believe you have an answer as to restenosis that may not have been considered-it would be wonderful to get your input to the doctors. Nigel, Joan, I'll let Anqelique respond to your suggestions. But thanks for the links. Anon@5:50, it's on it's way. @Nigel and Joan. Thank you very much for your comments. I am going to reply to both, as your questions have some overlap. Nigel, I have no doubt that a wound is part of the mechanism of MS. But I do not believe that it is the etiology of the disease. What causes the wound in the first IS more likely to be the etiology. As we know from many cases of MS, the disease can be triggered by any number of events, ranging from trauma to bacterial, viral or even parasitic infections. And this is where the wound to the BBB (blood brain barrier) is a result, rather than a cause, of MS: under hyperlipidemic conditions, platelet-expressed CD36, a scavenger receptor, sense oxidative stress and modulate platelet reactivity, leading to vascular atrophy and thrombosis (which also explains – in part – the narrowing of blood vessels). By increasing platelet aggregation, CD36 alters the structure and permeability of the BBB, increasing the adherence of platelets to microvascular beds and activating the neurotoxic cytokines. Furthermore, under hyperlipidemic condition and dysregulation of the lipid homeostasis, the expression of the central lipid/immune system node PPARβ/δ in the brain, which regulates the integrity of the BBB by controlling the VAP-1 adhesion molecules, as well as enhance angiogenesis and vascular repair, collapses. The deficient expression of PPARβ/δ, induced by elevated levels of free fatty acids and oxLDL in the serum, results in impaired vascular repair, diminished vascular flow, a reduced hyperplastic development of the microvasculature, and dysregulation of the VAP-1 adhesion molecules, inducing more rolling monocytes to enter the layers of the endothelium, which will eventually choke on excess oxLDL, not go through apoptosis (ie. those now toxic, oxLDL loaded monocytes-become-macrophage do not die) and accumulate as cytotoxic plaques on the CNS, causing lesions and inflammation. So Nigel, yes, there is a wound, but I really don't belief it is the origin, but a mechanism, part of the process of MS. But I do not believe it is part of the etiology. In terms of restenosis, a deficient PPARβ/δ accelerate the expression of endothelin-1 (ET-1), a potent vasoconstrictor and regulator of vascular smooth muscle cells (VSMC) proliferation, and stops the synthesis of the main vasorelaxant, nitric oxide (NO), which leads to severe restenosis, by constriction of the vessel and unchecked accumulation of smooth muscle cells. Joan, what CCSVI does, is that it alleviates (for some), the symptoms of restenosis, but does not treat the cause of the restenosis. And I am afraid that many patients, sooner or later, will have relapses, since the root of the problem has not been taken care of. And those relapses may be worse than the original condition, because of the trauma of surgery. Now I know that many people would happily go through the CCSVI treatment to have, if only for the amount of time it will last, the alleviation of those symptoms. I absolutely respect that. @ Joan and anyone interested in CCSVI: I think I found a good metaphor which reflects my views on CCSVI. Imagine your body is a diesel car. You put in it regular gas (cheaper, more conveniently available). Eventually, your engine's tubes get clogged, because it is the wrong fuel. To remedy that, you replace the tubes, but your engine is still a diesel, and you are still putting regular gas in. Eventually, the new tubes will get clogged again, and what's worse, smaller, irreplaceable, parts of the engine will break down because the source of the problem has not been addressed. Of course there are limits to this metaphor. But this is pretty much my view on the problem: you cannot mechanically fix a problem that is not mechanical in origin. Any fix like that is temporary. Though I perfectly understand and respect that a temporary fix is, for some, a real source of hope and strength. Regarding CCSVI, my own views on CCSVI are public: I wouldn't do it until/unless I get the disease itself under control. But everyone's disease is different. Everyone gets to make their own choices. People have their own lives and own reasons. If I can clear up the terminology, Angelique, there is some confusion on your part. “CCSVI” is a medical condition, documented by Dr. Paolo Zamboni–chronic cerebrospinal venous insufficiency. The treatment is called venoplasty–or angioplasty on the veins. CCSVI IS mechanical. It is caused by truncular venous malformations found in the jugular veins of pwMS. Dr. Fox of the Cleveland Clinic found malformed valves in jugular veins of pwMS upon autopsy. To put it in layman's terms and use your analogy, it is a broken valve, just like a broken valve in an engine. Please read Dr. B.B. Lee's explanation on congenital truncular venous malformations. They are formed in the womb. The fix is not temporary. My husband received stents at Stanford University, and has not restenosed in almost 3 years. His gray matter atrophy has reversed, his cerebral hypoperfusion is gone. He has had no relapses, no MS progression. It's not about hope…it's about the physical reality of a congenital malformation being repaired. Joan, yes, I did mean CCSVI treatment. I am very happy for the success of the treatment in your husband, and hope that he will enjoy a relapse-free life. I want to reiterate that, though I am skeptical, I respect patients choosing to undergo the treatment and applaud their success, when warranted. As a scientist, however, I must keep on questioning results in terms of statistics. And so far, there are none to be had. I, like many others (I am expecting Dr. Z included) expect those impatiently. I also understand very well that for many, waiting is not an option. And yes, if possible (heavy teaching load next semester! ), it would be lovely to attend the ISNVD conference. is dysregulated? so I can go and verify?eg oxLDL? drAC: Yes, indeed, there is a method. Regular tests usually do not detect the finer kinks of the lipids, such as oxLDL levels, or VLDLs. These tests have to be done in specialized lab. You can ask your GP (personal physician) to point you to such a lab in Poland. There should be a dozen at least able to perform that test. drAC: Yes, so that's already showing a trend towards too much LDL, which then increases the possibility of turning into oxLDL and lead to further exacerbation of your symptoms. Have you discussed the possibility of lowering your cholesterol with your doctor/ personal physician? In my case its 24 (range 30 – 80). have cholesterol and vitamin D in normal, how can it be explained? Does it have any meaning those levels of cholesterol? drAC: Low levels of vitamin D are common in patients with MS. The levels are particularly low when the cycle of MS is close to or after a relapse. During remission, patients may experience normal levels of vitamin D (but usually not without some supplementation). Also, levels of vitamin D depends from populations to populations (in some populations, the levels of VD3 may be normal), and from the type of MS you may have. it work according to your theory? drAC: It acts on your immune systems cells, and prevents the Th1 to become inflammatory by shifting them into the less anti-inflammatory Th2 cells. It fits in my framework by performing the role that a functional PPAR alpha has: to activate the IL-4 Interleukin-4 which stimulates the differentiation of naive helper T cells into Th2 (CD4) cells. If your PPAR alpha is deficient, due to a dysregulation of lipids, than your Th2 cells are differentiate into Th1, toxic cells. So, in effect, copaxone replaces that one disabled function of the PPAR alpha. Can we – patients help you somehow in the research? drAC: I am going to write a biweekly lab blog, which will keep up with research in my lab, and will post any news or link of interests. Tomke, Angelique, thank you so much for sharing all that information. I'm both fascinated and excited by this news. I'll certainly keep an eye on this useful blog. Thanks to both of you! Hello and thank you for this wonderful research! There are many in the MS world who have successfully reversed their condition and gone from being bedridden or in wheelchairs to walking and running normally again by going on specific diets (no gluten, no sugar, no alcohol, little-no grains/ starches and eating lean meats, low sugar fruits, nuts and seeds and lots of vegetables) along with taking specific supplements and exercising. How could diet/ supplements/ exercise impact 'faulty lipid metabolism'? Do you think that those who have successfully reversed their MS (through diet/ exercise/ supplement/ stress management) did it by unintentionally fixing the problem you are proposing? Can PPAR dysfunction be remedied with lifestyle changes? Thank you and best of luck with your future endeavors! K-Man, I believe Dr Corthals (the real authority) is currently travelling so might not be able to respond for a day or two. My non-expert opinion is that, yes, dietary (and other changes) can improve PPAR function which leads to an unravelling of the vicious cycle of MS.
Vladan, the paper is on its way. Airon, I'm really glad you've found something that works. I love the way everyone ignores the “high carbohydrate, High Sugar intake” portion of her hypothesis and immediately focus on fat Intake. Beth, people hear 'lipid' and jump to conclusions. But I think the carbs are very, very important. Research sounds related to my condition and would very much appreciate a copy of the research paper. Thank you. QUESTION for Dr. Corthals: if diet is responsible for disrupting lipid homeostatis, why would you look to drugs (statins and fibrates) to address the symptoms? Wouldn't it be preferable to change the diet and thereby remedy the actual CAUSE of the problem? Anonymous: the lack of lipid homeostasis can be genetic (compounded by environmental factors – just like hyperlipidemia), and in that case, diet alone will not be sufficient. LDL-lowering drugs and PPAR agonists (fibrates) may be necessary. But neither statins or fibrates as they are currently on the market would help in their current state. It would have to be a very carefully controlled, individually tailored the patient use of made-for-MS fibrates, if necessary supplemented by statins. Anon, Angelique, I really hope the pharmaceutical industry is paying attention. Similarly, I hope that people with MS don't start just randomly taking fibrates and statins hoping for a miracle. Do you address the foregoing research in your paper? What are the implications for your proposed use of statins in treating MS? Nicola, your concern is certainly not unwarranted. Ever since I was diagnosed I started taking 4000iu vitamin D daily and changed my diet to include less carbs and fat and more lean protein such as tuna, lost about 60lb. That was 3 years ago. Now I am reading this article and so far it all makes sense. I doubt these changes I have made will correct the problem but at least I am convinced it should not make it worse. The only puzzling part is none of my relatives even distant ones have MS and their diet consists of similar food and quantity. Only difference being I moved to a colder country when I was 15 and got diagnosed when I was 29. Anon, colder generally means farther from the equator which means less sunlight. This, of course, means less production of vit D. That's the difference–or at least part of it. Nicola, even before I was 15 I was not much of an outdoor person so I know vitamin D definitely plays a role in it. Also up until I was diagnosed me and my family were a big fan of carbs. Maybe its a cultural thing but we ate a lot of white bread,rice and pasta and cheese. Anon, well, if you're genetically predisposed to MS then, yep, that diet wouldn't be good. Hi Kath, I believe the article is highly problematic in that it summarily promotes pharmaceutical intervention via lipid-lowering medications, including statin drugs. I am still awaiting the author's response to my preceding comment on the matter. I cited examples from an ongoing body of research indicating statins are detrimental to myelin — which is of special concern in this context since, as we know, MS is a demyelinating disease. But crucially what 'carbs' are you talking about? And what saturated 'animal fats' This is so non specific as to be fairly meaningless. Almost every vege/fruit has some carbohydrate. There is a world of difference between say KFC deep fried battery chicken in rancid veg oil-and say grass fed anything, oily fish, free range poultry etc – There is a world of difference between white 'bread'and sugar and say a baked yam -all carbs. Its very dangerous being inacurate and vague about definitions,you must be as specific as possible or it breeds paranoia, dangerous confusion and misunderstandings about diet. Plus the American diet appears to be the most grotesque, unnatural and bizarre on the planet-It barely registers as nourishment. Why do you talk about CCSVI as if it was a blocked artery, dependent on diet? So what kind of diet would you suggest is best for reversing this disease? I’m currently a vegan 85% raw (I follow a RAW until 4 vegan diet) . I’m Hispanic and take 15-20 minutes of direct sunlight. I don’t consume any processed foods or fried foods, just grains and legumes about 3-4 times a week, the rest of the days I’m completely raw. I’m not a medical professional and so this advice is based purely on my personal experience. Do, please, consult your healthcare provider. I’m not a big fan of raw food (I don’t think you get as much nutrition as from cooked, whether we’re talking veggies or animal protein). My biggest recommendation would be to get a reasonable amount of good quality protein–which I found difficult on a vegan diet–and enough good fat; supplement with fish- and/or flax-oil if necessary. I think direct sunlight daily is probably enough if a) it’s on more than face and arms b) you’re far enough south. Otherwise, supplement with vit D.
All this advice is predicated on getting blood work so you know what your lipid panel looks like. (If you have great insurance and a great doctor, go full bore on the lip panel. Otherwise a regular triglyceride/HDL/LDL/oxLDL is fine to start with.) Also check your vit D levels–it’s fast and not expensive, and the only way to be sure whether or not to supplement. Depending on what kind of MS you have and what stage you’re at, this diet may or may not make an appreciable difference. But in my opinion it won’t do you any harm, and it’s very likely to do some good. Interesting. What does your blood work look like? I was diagnosed at 32 with M.S., did not take medication for M.S. as at that time they were just coming out with it. I lived for 25 years without any other symptoms, until after menopause. It has come back with a vengence. I have lost some control of my right side and vision has been affected. Do you think there’s a connection? Trudy, I’ve no idea. If these are MS symptoms–and they might not be–they could be due to (reproductive) hormonal changes (reproductive hormones), diet, vitamin D, and a host of other things. Most of them are interconnected. Make a list of everything that’s changed in the last few years and go talk to a doctor. HSCT is, I think (bear in mind I’m not a medical professional), a version of the work Robert Brodsky was doing in the 90s. My neurologist (after some pressure from me) talked to him; the long-term data were not as for the first 5 years. What they seemed to indicate was that eventually the immune system reverted to the same faulty behaviour as before the treatment. Given the risks (that kind of immune system ablation was still in its early days) I chose not to go ahead. But, and this is a big but, if I were faced with the same decision today, if I were at the same stage of MS i.e. lots of inflammatory episodes, I think I would do it. It’s not a cure (in my opinion) but it does reset the immune system temporarily and so delay by years axonal death. And that is, I think, important. It sounds as though you know what you need. Good luck! This is a fascinating story! Like all things MS – there are contradictions all over the place. I have PrimaryProgressive MS for 20 years now – and have never been on any of the DMT’s since the side effects all frightened me – and they didn’t seem to be a real answer for PPMS anyway. Dr. Wahl’s is doing so well on a high fat diet, and others have done well on Swank low fat! today – and some think this is due to stress and the high use of contraception (interrupting hormone function). I’m pretty sure I fare better with a lower fat diet – I don’t seem able to tolerate the Wahl’s protocol exactly. And while I prepare all my own food, it isn’t as easy as it used to be!! I didn’t know MS used to be 1:1 women:men. I thought it had always been as lopsided as it is now. Do you have a link I can follow to track the changes? Wish I did have a link – I don’t recall where I read that bit of information – but I do remember it! can – and as I can afford ;) I live with my boyfriend who is a sweetheart, but not so great in the kitchen! I use a walker (everywhere) and was curious about the use of crutches – is that easier for you than a walker or a wheelchair? I’ve never been on the meds – are you just now not taking anything? I was diagnosed in 1994 – seems like an age ago! If you’d like to continue the conversation offline, email me via the Contact form, okay? Barbara, just sent you a long email but it bounced. Gmail tells me “Address resolution of yc.rr.com. failed: Domain name not found” So will you just ping me with your address again and we can try sort this out? After 30 years of random joint pain I have finally gotten a diagnosis of lyme disease (plus co-infections). At least according to part of the medical community. As you probably know the medical community is deeply divided on the testing and treatment of lyme. I stumbled across your website while researching Lyme disease. I have read a book by Richard Horowitz MD, a lyme specialist in the US (treated over 12 000 patients) who in the book wonders if at least many cases of MS aren’t actually Lyme disease. (it is known as the great imitator). Do you think this could be possible? What if it is a different strain of Borrellia that causes more MS like symptoms and also doesnt present with the often absent EM (bull’s eye rash) and we miss it with diagnostics (western blot test) because it only shares some similar outer surface proteins? I first was diagnosed Early this year with SIBO. A common diet for treating SIBO is the SCD diet which is very similar to the Wahls diet. It is interesting the links that keep coming up between bacteria, diet and heavy metal toxicity in the body…. Otzi the iceman had traces of arsenic in his hair…. @Mark: I think it’s entirely possible that some people diagnosed with MS have some kind of tick-borne disease. I’m pretty sure I’m not one of them—not Lyme, anyway. If I’d grown up here in the US I’d consider some sort of rickettsia. About fifteen years ago it was determined that R. felis was in fact endemic to the UK (in cat and dog fleas) so I might one day be tested for that. As for SIBO, I regard it as more a symptom than a cause—though of course messing with the microbiome can cause some serious symptoms in its own right. And the specific carbohydrate diet can be useful in many, many ways. Good luck with your Lyme treatment. I was diagnosed with multiple sclerosis 1 month after I turned 50. My Grand-mum was 96 and had it since she was in her 20s. I was on Copaxone, the first year was daily and later I was on 40 mg, 3 times a week. It made a tremendous difference for me. Although the fatigue was what really gets to me. When I do too much, I do start to feel weak.There has been little if any progress in finding a cure or reliable treatment. My multiple sclerosis got significantly worse and unbearable because of my cognitive thinking.. Last year, i started on a natural multiple sclerosis Herbal therapy from Green House Herbal Clinic, i read a lot of positive reviews from patients who used the treatment and i immediately started on it. I had great relief with this herbal treatment. I am doing very much better now, no case of Cognitive thinking or memory Loss,, my multiple sclerosis condition is totally reversed. Visit Green House Herbal Clinic website w ww. greenhouseherbalclinic .com. I am thankful to nature, the medics failed. Share with friends! !